Aircraft leasing giant, Air Lease Corporation has confirmed it has agreed with SAS the long term lease agreements for three new Airbus A321-200neo LR aircraft. The aircraft are scheduled for delivery in 2020 and 2021 and will add to two A320-200neos on lease to the airline, for a total of five Airbus aircraft confirmed to deliver to SAS from ALC. 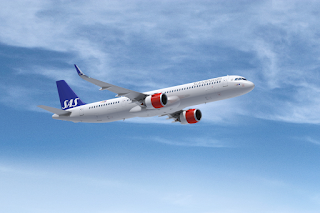 “The A321LR is a key addition to SAS’ fleet with the capability to reach the airline’s most important international markets, as well as new destinations in smaller markets – all from Scandinavia,” added Marc Baer, Executive Vice President of Air Lease Corporation. The A321LR is a narrow-body aircraft that have been especially engineered and configured to fly longer distances than a standard A321neo model. The aircraft has sufficient range to reach Northeast US, one of the most important intercontinental markets for SAS. The A321LR can also reach destinations in Canada, the Middle East and India from Scandinavia. The aircraft is part of the latest generation of aircraft and is expected to reduce climate-impacting emissions by a similar amount as when SAS introduced the A320neo. The carbon footprint of the latter is approximately 15-18 % smaller than an equivalent size aircraft of the previous generation. “Climate is a crucial issue for the airline industry and SAS aims to lead the way in driving the switch to sustainable travel. We have set a target of reducing carbon dioxide emissions by 25% by 2030,” Gustafson says.